When it comes to celebrity engagement rings putting a price on it and deciding on the size certainly knows no bounds. As Elizabeth Taylor once said, “Big girls need big diamonds”. A saying some of Hollywood’s elite don’t take lightly. Today, celebrities such as Beyoncé and Melania Trump sport their million dollar diamond rings as they make the rest of the world emerald with envy. 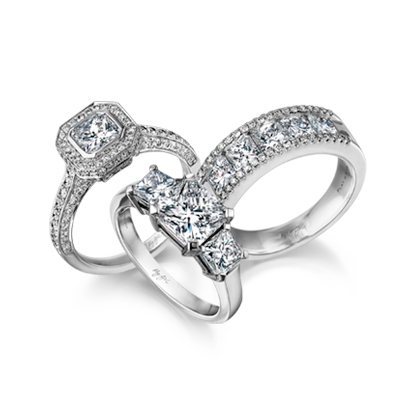 But just how iconic are these magnificent engagement rings? It might not be the most expensive or extravagant ring on the list, but it’s truly the most iconic ring of recent time. This beautiful 12 carat oval blue Ceylon sapphire ring surrounded by 14 solitaire diamonds was once the engagement ring of the late Princess Diana. Today, the gorgeous Duchess of Cambridge (and wife of Prince William), Kate Middleton, can be seen wearing this remarkable ring. When Prince Charles bought the ring in 1981 it was valued at R470 000. But, if you had to buy it today, the iconic ring will cost you an estimated R5 million. It took a while for Enrique Iglesias to get down on one knee, but when he did he made sure the moment was truly unforgettable. The King of Latin pop proposed to Anna Kournikova with an naturally fancy yellow radiant-cut diamond with two trilliant stones on the side. Elizabeth Taylor’s engagement ring has become one of the most renowned diamond rings in the world. Richard Burton proposed with a 33.19 carat Asscher-cut diamond ring worth R119 million. The couple married twice – once in 1964 and again in 1975. In 2011 the diamond was auctioned to an unknown Asian collector. Jay Z liked her so much he decided to put a ring on it. The rapper and business mogul got down on one knee and asked Beyoncé’s hand in marriage with a 20 carat emerald cut diamond ring. The breathtakingly beautiful and massive diamond ring is worth an estimated R67 million. Mariah Carey has a vision for love, and it involves the biggest diamond ring in the world. The singer has managed to outshine Beyoncé and Elizabeth Taylor with her 35 carat diamond ring from former fiancé, James Packer. The Australian businessman and investor proposed to Mariah with a diamond ring worth an estimated R100 million. It took a few craftsman and a large diamond expert to perfect the ring in two weeks and twelve hours. But, unfortunately seven months after the proposal the billionaire called off the wedding to Mariah. Luckily, she was not asked the return the ring and can still be seen wearing the jaw-dropping diamond ring, but on her right hand. The way Taylor Kinney proposed to Lady Gaga couldn’t be any sweeter. The Chicago Fire star got down on one knee and asked the question on Valentine’s Day with an edible candy ring. But to her surprise, the true romantic at heart, made the proposal even more spectacular with a beautiful heart shape diamond ring worth an estimated R5 million. The engagement ring features a diamond studded setting and band with a personal message from Taylor. Their initials, ‘T’ and ‘S’ are engraved on each side of the heart shape diamond. Sadly, the couple called off the engagement after being together for five years. Before she became the first lady of America, she was the queen of Donald Trump’s heart. The President of the United States of America proposed to the Slovakian model in the Grand Hotel Toplice in Slovenia. He popped the question with a 15 carat emerald cut diamond ring worth R40 million. Today, these rings stand out as some of the most iconic engagement rings of all time. It does help if you’re a celebrity and the sky is your limit, yet a more modest ring has as much meaning as a million-dollar stone.